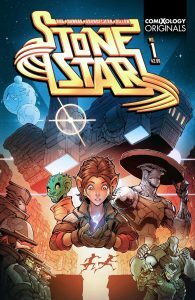 Stone Star #1, a new indie digital title, comes to us fresh from outer space, courtesy of writer Jim Zub and artist Max Dunbar (colours by Espen Grundetjern). This five-part mini-series takes place on Stone Star, a traveling space centre, which brings entertainment, gladiator competition, and celebrities on a tour of the galaxies. The ultimate in mobile fanfare and danger! Dail, a teenage thief, stumbles upon secrets and secretive warriors on the visiting Stone Star. It seems that Dail has some special talents of his own. Which way will his new-found companions influence him? Stealing? Swords? Sorcery? It’s a fun and invigorating read for a few reasons. The concept of a traveling gladiator arena is certainly new, but some of Zub’s approach is familiar. In a good way. You know how your favourite movies engage you right from the beginning? Where the filmmaker SHOWS you ideas instead of just telling you? Such is the case with Stone Star. The characters ‘act out’ their motives and personalities. Proof in the pudding. There is a lot to discover in this first issue! The graphics are well handled, with lots of original character and environment design. The first issue includes sketches and creator notes. This creator-owned comic is available online via Comixology. Stone Star #1, $2.99 for 22 pages of comic content. Not rated, assume all ages.